Our Problem Tags and Opportunity Tags are used to flag the locations of items needing improvement right on the equipment. 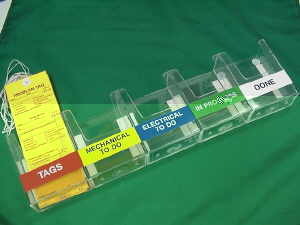 We have developed a set of high-impact plastic tag pockets to hold the bottom parts of the tags. These pockets (3.5″ x 4.75″ x 1.5″) can be attached to your “action boards” or walls with screws or the included double-stick tape. This set of five individual pockets comes with labels for you to attach: Tags, Mechanical to Do, Electrical to Do, In Progress, Done.